stickboybike: Could cyclocross racing be the pill for every ill? Could cyclocross racing be the pill for every ill? Better bring an umbrella because cyclocross is gonna rain down talent on the world of road cycling. Ok. That might be a bit of an exaggeration but let's face the facts when it comes to bicycle racing. Certain venues, specific courses, when combined with set weather conditions, will favor the rider who is most comfortable during those conditions. Anyone remember the 2012 Olympics in London during the women's road race? Yes, it rained that day. The women's road race was won by Marianne Vos-- the World Cyclocross Champion from 2006 and in 2009-2014. 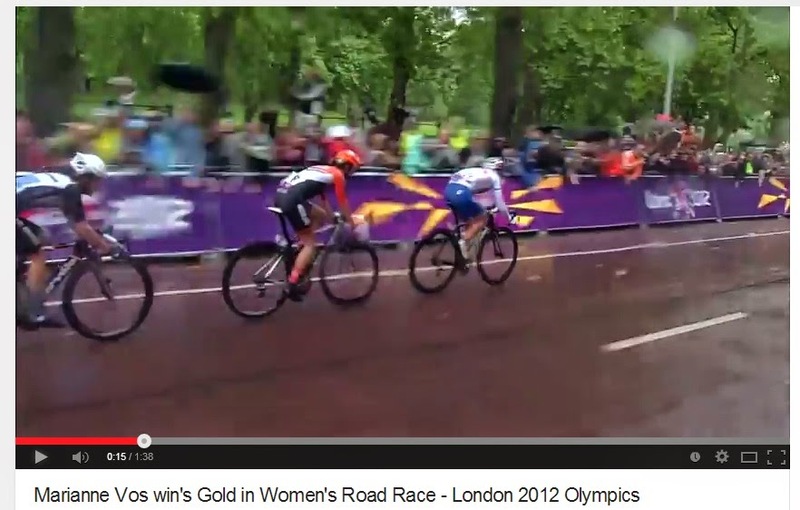 2012 London Olympics Wm RR- click for video. Yesterday, we saw what was probably the worse weather conditions for the Tour de France in decades. Temperatures in the low 50s, rain, and 18 mph crosswinds challenged the riders during Stage 5 of Le Tour. I don't like to see anyone hit the deck while racing. I know what that feels like to lose your wheels in a corner at 27 mph. The wet roads of yesterday's stage left the course looking like a toddler decided to dump his box of toys out in the street. What caused all this? I don't know where to start nor will speculate. But what I will point out is the group of 12 riders who went early off the front, properly played their cards. Getting clear of the congestion was key for the group of riders yesterday afternoon and one thing I noticed was the bikes they rode. Most of the top 20 to cross the line during Stage 5 were on some version of a road endurance frame. Road endurance geometry bicycles have been in the states for roughly 7 years now with Bianchi, Specialized, Cervelo and finally Trek and BMC leading the bulk racing world with something for the pro guys to pedal when road conditions turn to crap. 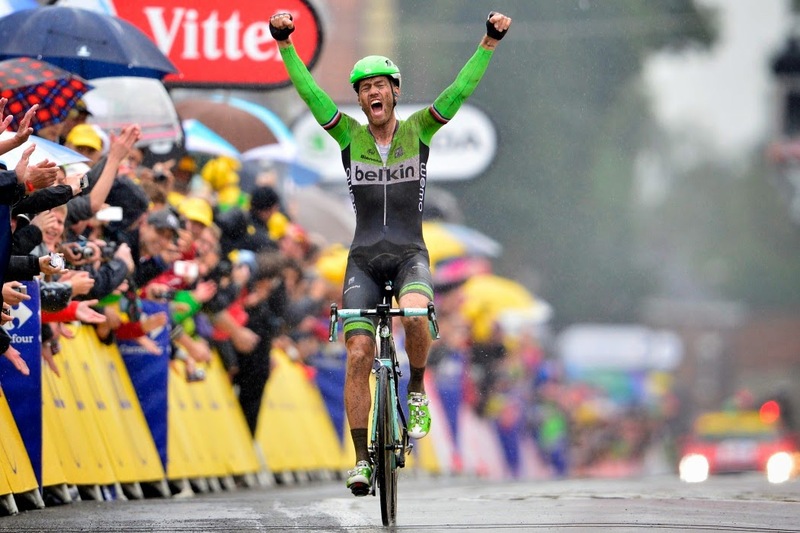 Lars Boom took the 'W' yesterday aboard the new Bianchi Infinito CV bike. Yes a lot of racing boils down to the skill of the rider but if you give the worker the proper tool, they can do their job efficiently and effectively with help from their team members. The Infinito CV, carbon frame is constructed with hi-mod carbon and a viscoelastic material called Countervail which greatly reduces road vibrations within the frame. The material not only will reduce vibration but acts as a strengthening component and a stiffening agent when incorporated within the layup schedule of the carbon fiber frame. CV for short, is used in specific areas of the frame in order to optimize it's ability to eliminate road vibrations for the cyclist. The wheelbase of the Infinito CV is longer than that of the other bike that Belkin uses during the Grand Tours; the Oltre. The CV provides stability across cobbled road surfaces, chip sealed roads and dirt farm lanes by using a 45mm rake fork versus the Oltre's 43mm and B.A.T.- Bianchi Active Technology. B.A.T. has been developed through Finite Element Analysis and offers a ride experience where maximum pedaling force is transferred from the bottom bracket, back through the chainstays and into the rear wheel. B.A.T. at the head tube, top tube and rear triangle, offer a needed level of frame compliance; smoothing out the hard bumps the bike is subjected to during a ride. A PressFit 30 bottom bracket and a tapered head tube offer responsive acceleration and steering. The head tube angle is about 15mm taller than the HT on the Oltre. This allows the handle bars to be arranged at a height with spacers for gran fondo riders or can be set up without spacers for the more fit and flexible bike racing crowd. Both types of riders will enjoy the smoother steering of the Infinito CV thanks to it's one degree slacker head tube angle over the Oltre. Juan Antonio Flecha was a huge fan of the Infinito CV during his last year of racing with Vacansoleil DCM in 2013. He loved the bike so much that he kept riding it after the Spring Classics were over; when many racers go back to racing on frames with steep frame angles and tighter geometry. As a personal bike, he asked to buy a CV; which Bianchi refused to take his money and instead gave him one. JAF was explaining to our CEO last season that during the races he was out gunned on the climbs by racers who were 10 years younger than him. But during the descents in the mountains on the poorly surfaced European roads, he was making up minutes on those guys. He attributed this to the fact that the frame had Countervail material in it. When many carbon bikes are pushed to their limits at high speed, they will vibrate subtly enough that you upper body makes micro corrections in order to keep the bike tracking straight. These tiny corrections become wasted efforts and over the course of a 4-5 hour ride, can create fatigue in your wrists, arms, shoulders and upper back. Flecha was able to focus on what was coming up the road while the bike tracked straight as an arrow; all of which translates to sustained physical energy and more speed on the bike.